India’s #DestroyTheAadaar: Is the FBI’s Secret Biometric ID Program to be Transferred to US Department of Defense? India's Aadhaar Project. There is a lawsuit filed against FBI for information about the agency’s plans to transfer biometric data to the Department of Defense. It is now commonly known that American firms with links to CIA were given contract for Aadhaar and acknowledged by the Ministry of External Affairs itself, will Aadhaar database than be transferred to the US Department of Defense? 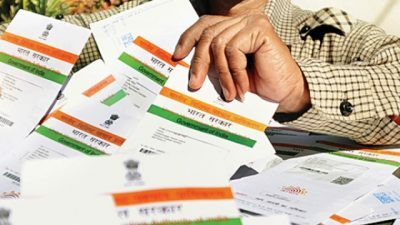 There is a growing movement brewing up in the country [India] regarding the dangers of Aadhaar and how it is being pushed through the backdoor without adequate security on unsuspecting Indians. While the general public is still in the dark about the dangers of biometric identification that is taking place in nearly every walk of life, even privacy defenders who have been closely following these developments don’t have sufficient information. Like the Indians even the Americans are fighting a similar battle on their homefront. But unlike Indians the American public are far more informed and organized in their approach. It would do well for the defenders of privacy and the advocates of #DestroyTheAadhaar to follow up on a lawsuit that is filed against the US Federal Bureau of Investigation for running a Biometric ID program for years in secret. The FBI case could provide the Indian activists with a better reorientation and understanding of the process. It’s been estimated that half of all adult Americans appear in a biometric database. Despite what is clearly a sweeping program of surveillance and a violation of numerous Amendments to the US Constitution, the FBI has resisted all inquiries made by privacy organizations and even the House Committee on Oversight and Government Reform. Has Unique Identification Authority of India (UIDAI) done the privacy assessment of the entire Aadhaar project before awarding contracts to American firms? Have the Aadhaar activists asked the UIDAI to furnish the Privacy Impact Assessment Document if at all there is one? There is a lawsuit filed against FBI for information about the agency’s plans to transfer biometric data to the Department of Defense. It is now commonly known that American firms with links to CIA were given contract for Aadhaar and acknowledged by the Ministry of External Affairs itself, will Aadhaar database than be transferred to the US Department of Defense?